If your child has been diagnosed with depression or has signs or symptoms of childhood depression, you may wonder if the natural herb St. John's wort might be appropriate for her. What do we know about the effectiveness as well as the safety of St. John's wort in treating childhood depression? St. John's wort is an over-the-counter natural herb also known as Hypericum perforatum. It is also known as Klamath weed, hypericum, and goatweed. People have reported using St. John's wort for a wide variety of symptoms and disorders including, depression, nerve pain, sleep problems and anxiety. St. John's wort has even been studied in the treatment of attention deficit hyperactivity disorder in children, though recent studies suggest it is ineffective when used in this way. This flowering plant is not only used for many different purposes but is available in a variety of forms. The extract is available either alone or in combination with other herbs as a nutritional supplement in capsule, tablet, liquid, or topical forms, and the flowering tops may be used in teas. According to the National Center for Complementary and Alternative Medicine, St. John's wort is not a proven effective treatment for depression. However, there are studies which have shown it to be effective in the treatment of depressive symptoms in adults both when compared to a placebo and when compared with prescription depression medications such as Zoloft (sertraline.) Overall, when used appropriately, St. John's wort appears to be comparable to serotonin reuptake inhibitors (such as Prozac, Zoloft, Celexa, Zoloft, and others) with respect to both effectiveness and safety in the treatment of depression in adults. Studies using St. John's wort in the treatment of childhood depression, in contrast, are few. A 2005 study found that St. Johns wort was well tolerated and may be effective for adolescents with mild depression. A 2003 study looking at boys aged 6 to 16 found that 25 of 33 of these children met response criteria after 8 weeks of treatment with St. John's wort (usually titrated up to 900 mg daily) and was well tolerated. Studies looking at adults can give us some indication of how a medication or supplement may work in children, but this is not always the case. Children aren't simply little adults who may just need a lower dosage of a drug. An example to illustrate this concern is the use of prescription antidepressant medications in children. A potential danger of using some antidepressants in people under the age of 25 is that they may worsen suicidal thoughts or behavior. This side effect is quite uncommon but significant enough for the FDA to put a boxed warning on all prescription antidepressants. We do not have any information on whether St. John's wort might carry the same concern, but since St. John's wort may alter neurotransmitters in the brain in a way similar to antidepressant medications, it is a question worth asking. Regardless of any potential risk, a diagnosis of depression alone is associated with a higher risk of suicide, and parents who suspect their child may be depressed should be familiar with the warning signs of suicide. St. John's wort has the potential to interact with many commonly used medications. This possibility was addressed in 2000 when the FDA issued a public health advisory about these possible interactions. Due to its effect on enzymes in the liver, St. John's wort may either decrease the levels (and effectiveness) of some medications or instead increase levels raising the risk of toxicity. While some of these reactions may be minor or simply a nuisance, it's known that dangerous and life-threatening reactions may when St. John's wort is combined with some drugs. If you are considering the use of St. John's wort for your child, it's important to talk to your pediatrician or child psychiatrist about any medications, herbal supplements, over-the-counter drugs, or vitamins that your child is taking. It's sometimes thought that herbal medications are "safer" or that they do not have side effects because they are "natural." This is not true, and herbal preparations may increase the risk of adverse effects just like prescription drugs. The fact that St. John's wort is "plant-based" has led some people to feel these products are safer as well, yet it's important to keep in mind that many prescription medications, even some blood thinners, and strong chemotherapy agents, are plant-based. In general, parents should weigh the risks and benefits of any herbal products much the same way as they would a prescription drug, though this is sometimes difficult as herbal products are not regulated to the same degree, at least in the United States. 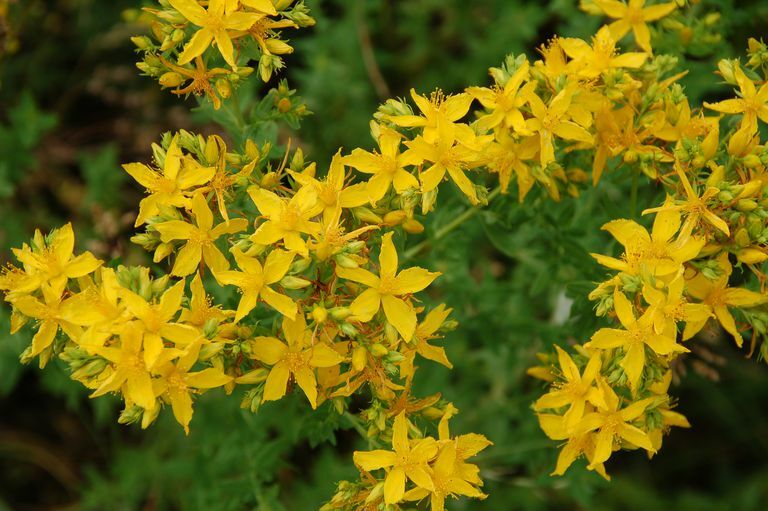 Common side effects of St. John's wort include a sensitivity to sunlight, dry mouth, dizziness, stomach upset, fatigue, headache, and anxiety. As a parent, you want to find the safest and most effective treatment for your child. So talk to your child's pediatrician or psychiatrist about St. Johns wort before giving it to her. A physician can discuss the risks and benefits and determine the best treatment options for your child's specific circumstances. If you are unsure if your child's symptoms are part of a depressive disorder, have your child evaluated by her pediatrician, a child psychiatrist or other mental health professional before trying any natural remedies. Of some concern is that most general practitioners (except in Germany) recommend St. John's wort only infrequently and may be unfamiliar with both the potential benefits and risks. Added to this concern is that many people do not disclose their use of this supplement to their physician. Noting the potential drug interactions above, this is concerning not only when it comes to the best management of depression, but due to potential medication interactions. While St. Johns wort may or not be appropriate for your child, you have already taken a major and important step in considering the presence of depression in your child. Depression is not uncommon in children and is a serious condition. Childhood depression can be difficult to diagnose in a child, and the warning signs of depression in young children aren't always recognized. From extreme shyness to irritability to anger, many parents may at first think they are facing a behavioral issue rather than depression. If you believe your child may have depression, talk to your pediatrician. You should learn more about using medications to treat depression in children, and how this is sometimes different than the approach in adults. The best treatment for childhood depression, however, involves much more than finding the right drug or supplement. Your doctor should be able to help you or refer you to a professional who can work with you to address your child's symptoms and create a plan to help her live as fully as possible. Forsdike, K., and M. Pirotta. St. John’s Wort for Depression: Scoping Review About Perceptions and Use by General Practitioners in Clinical Practice. Journal of Pharmacy and Pharmacology. 2017 June 27. (Epub ahead of print). National Center for Complementary and Integrative Health. St. John’s Wort. Updated September 2016. Ng, Q., Venkatanarayanan, N., and C. Ho. Clinical Use of Hypericum Perforatum (St. John’s Wort) in Depression: A Meta-Analysis. Journal of Affective Disorders. 2017. 210:211-221. What Is St. John's Wort Used For and Can It Benefit You? What Happens When Your Depression Doesn't Respond to Treatment? When Were the Earliest Accounts of Depression?